*I requested and received an advanced-readers copy from Scholastic. All opinions are my own. Told from the perspective of Brodie, a dog that just passed on. This is a touching tale about a dog who cannot move on in the after-life until he knows his boy, Aiden, is safe. Brodie returns to the “alive” world with his friend, Tuck. Together they encounter many trials and tribulations as they search for Aiden. Will Brody make it to Aiden before his soul is gone forever? Wow. Author Dan Gemeinhart does it again. Dog-lovers will devour this gripping, heart-wrenching story. Brodie is a dog who sacrifices EVERYTHING for his boy. Even when Brodie encounters dogs that are just plain evil, he stops at nothing to save his boy Aiden. Beautifully written, Brodies’ love for Aiden will stay with you long after you finish the book. This is my ten-year-olds second favorite book of all time. I recommend it for grades three and up. 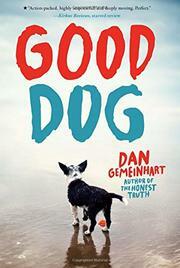 GOOD DOG will be released on March 27th.